The Polish language is written in its own version of the Latin alphabet, like English. Unlike English, however, Polish does not have the letters Q, V, and X. The Polish alphabet also uses four diacritics. These are the kreska ("dash"), the ogonek ("tail"), the kropka ("dot"), and the stroke. Ź or ź (a unique "zh" sound, like the "s" in "vision"). Ę or ę (like the "en" sound in "lend"
The letter Ż or ż (like "zh" but different from the Ź sound above) has a dot, and the letter Ł or ł (pronounced like "w" as in "wind") has a stroke. diacritic — a mark added to a letter to change the way it is pronounced. For example, when a "kreska" is added to the Polish letter "C", its pronunciation changes from a "ts" sound (as in "boots") to a "ch" sound as in "chocolate". nasal vowel — a vowel which is so called because it sounds like it is being said while the nose is blocked (hence "nasal"). Polish has 46 million speakers. Of these, 38 million live in Poland, while the rest live in countries all over the world. Around 10% of the EU population speak Polish. Over half a million Polish speakers live in the UK - most of these people are recent immigrants but many are Polish-British people who've lived there since the 1940s. As the place where it was first spoken, Polish is mainly spoken in Poland. There are also large numbers of Polish speakers in neighbouring countries such as Belarus, Lithuania and Ukraine, as well as important Polish-speaking communities in Argentina, Australia, Austria, Azerbaijan, Brazil, Canada, Czech Republic, Estonia, Finland, Germany, Greece, Hungary, Israel, Ireland, Kazakhstan, Latvia, New Zealand, Norway, Sweden, Romania, Russia, Slovakia, the United Arab Emirates, the United Kingdom, and the United States. Polish is an official language of the European Union. The history of Polish is closely linked to Mieszko I, the first Duke of Poland. Like most languages in the countries around Poland, the Polish language comes from the very old Proto-Slavic language, a dead language once spoken around central and eastern Europe. The Polish language as we know it today began to take shape around the 10th century, when Poland started to become a distinct state. 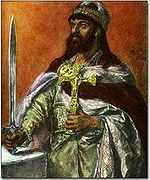 In particular, the history of the language is tied in with that of Mieszko I, the first Polish Duke, who united various Slavic tribes in the region that shared a similar culture and language. After Poland became Christian in 966, the new country adopted the Latin alphabet for its language. Before then, the language had no writing system, and only existed through people speaking it. The earliest examples of written Polish are religious texts written by members of the Catholic Church. Non-religious examples of written Polish emerged in the Middle Ages, and the language kept changing and adding new words from other languages, such as German, Russian and Czech. Today, Polish borrows many words for English for new items that have never existed before, such as computer, which is called komputer in Polish! Christmas is a very special time in Poland. One of the most popular carols sung there is the Jesus Lullaby. Sleep, little Jesus, my little pearl! And you, Mummy, hug him while he is crying. This page was last edited on 30 July 2017, at 06:16.